Dropbox has made it even harder for users to be hit by phishing attacks by adding USB-driven two-factor authentication to its service. The move means that users of the cloud storage service can plug a USB dongle into their laptop instead of manually entering a six digit code sent via SMS or created through an authenticator apps. "Security keys provide stronger defence against credential theft attacks like phishing. Even if you're using two-step verification with your phone, some sophisticated attackers can still use fake Dropbox websites to lure you into entering your password and verification code. They can then use this information to access your account," explained Patrick Heim and Jay Patel from Dropbox, in a statement. You do need to have a security key that follows the FIDO Universal 2nd Factor (U2F) open standard and the key can then be used with your Dropbox account or other services that support U2F such as Google. Setting up the key is as easy as going to the security tab inside your Dropbox account settings and choosing add next to the security keys option. Right now you can only use the authentication in Google Chrome and other devices or platforms will have to make do with the regular two-factor authentication. 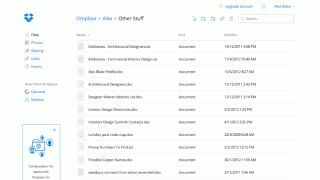 Dropbox has been making plenty of improvements in recent months and one of the most useful developments comes in the shape of integrating its storage offering with Microsoft Office to allow documents to be edited from within the Dropbox iOS app.